With it's affordable price you can pick up a few cables for use when you're at work, at play, or on the road, and with various sizes available various sizes available you can get a Lightning cable that's the right length for you. 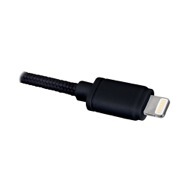 Use with Apple iPhone, iPad, and iPod models equipped with a Lightning connector for charging and syncing. Rating: 5/5 Better than OEM November 3, 2018 So much better than the OEM cables you get from Apple. The Bright colors are very helpful. The cable itself just feels stronger in your hands. The braided sleeve is very nice. Rating: 5/5 Best Cable I’ve ever bought August 28, 2018 Review posted a year and a half after purchase. Love this cable and take it every time I go on vacation or what have you. 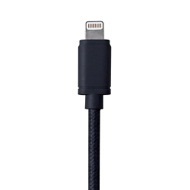 If you don’t have a 10 foot charge cable in your life get one, and get this one. I have a standard length one that stays in my backpack, as well. Rating: 5/5 All good August 16, 2018 Looks to be really good quality. Well built and sturdy. Much better quality than the official Apple ones. Rating: 5/5 Works great August 14, 2018 This heavier,built to last cable allows me the possibility to charge my iPad while using in a room without nearby wall sockets.The longer length and reinforcement of the cord are features I wanted.I realize similar products can be found cheaper online,but I have done business with company before and if I ever had an issue,they resolved it quickly and sent replacement free of charge-without an attitude! The phone reps are professional and helpful. 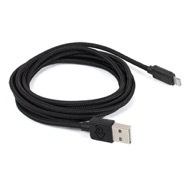 Rating: 5/5 Sturdy bright USB 2.0 cable May 28, 2018 NewerTech offers USB 2.0 cables in different lengths and colors. In addition to the standard black and white, the colors are bright. I like the green best of all; it is a distinctive neon green. 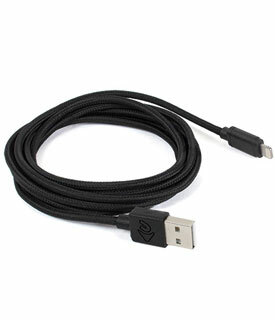 These cables are thicker than normal usb cables, and a braid protects the point of connection at the ends so that the odds of fraying are less. A sturdy product and worth the extra cost. Rating: 5/5 Excellent Charging Cable April 5, 2018 This has been a very reliable charging cable. 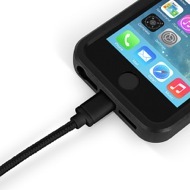 The heavy duty cable withstands wear. I've had no problems with the cable since it's purchase eight months ago. Rating: 5/5 Looks tough, works well March 1, 2018 Looks tough, works well, just like the pink one I bought first. Rating: 5/5 Quality February 19, 2018 Good quality cable that's still in use today. There are some very poor cables out there but this isn't one of them. I would purchase again. Rating: 5/5 Very Good Quality at a Great Price December 11, 2017 I have bought a few of these in the past to use with various iPhones I have owned—5, 5s, 6s and now 8—and am very happy with the quality. You can buy cables similar to these from pretty much anywhere nowadays, but the quality stinks and they don’t last. These cables are rock solid and last! Never any problems. Rating: 5/5 Size-compatible, better quality November 9, 2017 I always buy my iDevice cables from OWC. The Apple cables are PVC-free and therefore crack quickly (thank you, eco-activists), and high-end cables from other sources often have slightly larger tip connectors that don't fit the ports in my device cases. OWC's nylon braid makes them extra sturdy, a plus when you share a home and a car with energetic dogs. Aces! Rating: 5/5 Works great October 9, 2017 Works consistently well. The striking (obnoxious?) green insures that I have not forgotten it in a hotel room. Rating: 4/5 Not durable but good warranty May 19, 2017 2 out of 3 1m cables stopped working due to lighting plug breaking/bending. Fortunately their warranty process if very simple and straightforward and replacements arrived within a week or two. Rating: 5/5 Exceptional quality and value May 7, 2017 My kids go through lightning cables rather quickly and I've purchased lots of them over the years but these braided cables seem to last a long time. I'm talking years vs months. I believe it's the tough braiding on the outside that make them more durable but these are the only lightning cables that I buy now. They are better and cheaper than the originals. Rating: 5/5 Tough and Practical April 19, 2017 This is the cable to buy when you get tired of replacing the thin ones that your cat likes to chew on. The bonus is that you get a cat-proof cable, and the cat get to play with the old one to her heart's content. Rating: 5/5 Works well, great length. April 6, 2017 Very heavy, 5 year warranty, purchased two, different colors. Rating: 5/5 Durable construction March 16, 2017 I bought several of these cables for travel. These are stiffer and appear to be of heavier construction than those supplied by Apple. Recommended. Rating: 5/5 Just the length I needed! February 1, 2017 My wife likes to have her iPhone plugged in and charging next to the bed. The standard cable was a bit to short so I plugged in an extender cable for her. This cable, at a reasonable price, replaced the to cables and is easier to look at than my temporary setup. Problem solved and there are no complaints on quality or performance!